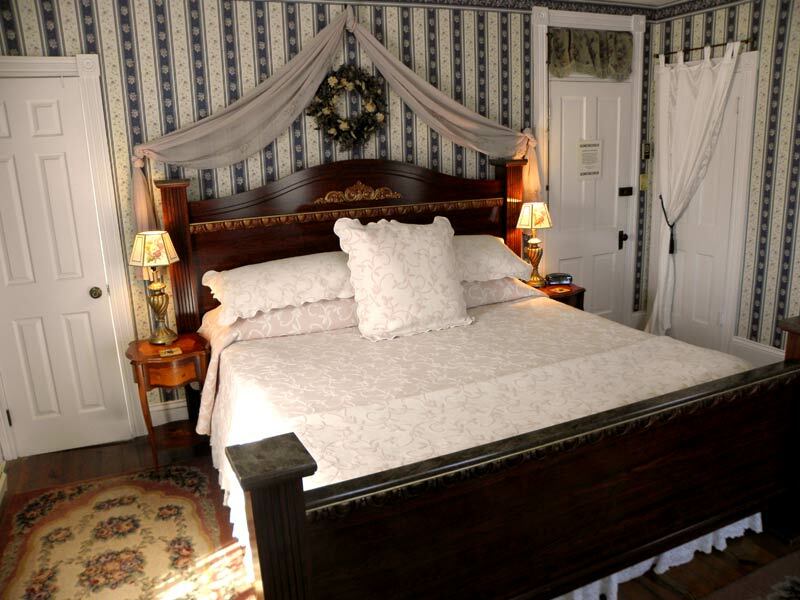 Miss Molly’s Inn is a sweet and charming seven bedroom Victorian Bed and Breakfast on Virginia’s Chincoteague Island. We are located on historic Main Street, minutes from shops, restaurants, and many other local attractions. Chincoteague (pronounced Shink-o-teeg) is the gateway to Assateague Island, a 37 mile uninhabited National Seashore and Wildlife Refuge and home to the famous wild ponies. Our Chincoteague Bed and Breakfast has five wonderful porches to savor the sea breezes. 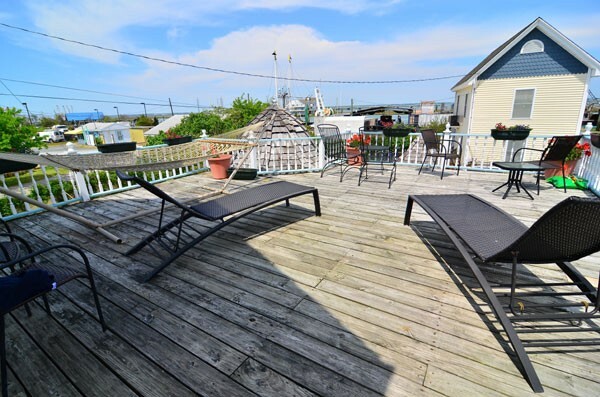 We have rocking chairs, loungers and even a hammock on our large second floor deck that overlooks the working bay. Indulge in tea, coffee, cookies and home-baked goodies, available 24 hours a day in our lovely screened in porch. Enjoy the hollyhocks and roses in our beautiful English garden, watch the mother ducks with their ducklings as seagulls soar above. To assist in making your Chincoteague Island stay at our Virginia Bed and Breakfast more comfortable we offer the following amenities. Inside your bedroom is an alarm clock radio, tissues, hairdryer, fluffy towels and chocolates by your pillow. In the house an extensive library, two cozy fireplaces, plenty of board games and cards, a guest refrigerator, filtered water, tea and coffee, cold beverages and nibbles. Outside we have bikes to ride around the Island and for the beach, towels, boogie boards, pails and shovels and beach chairs. 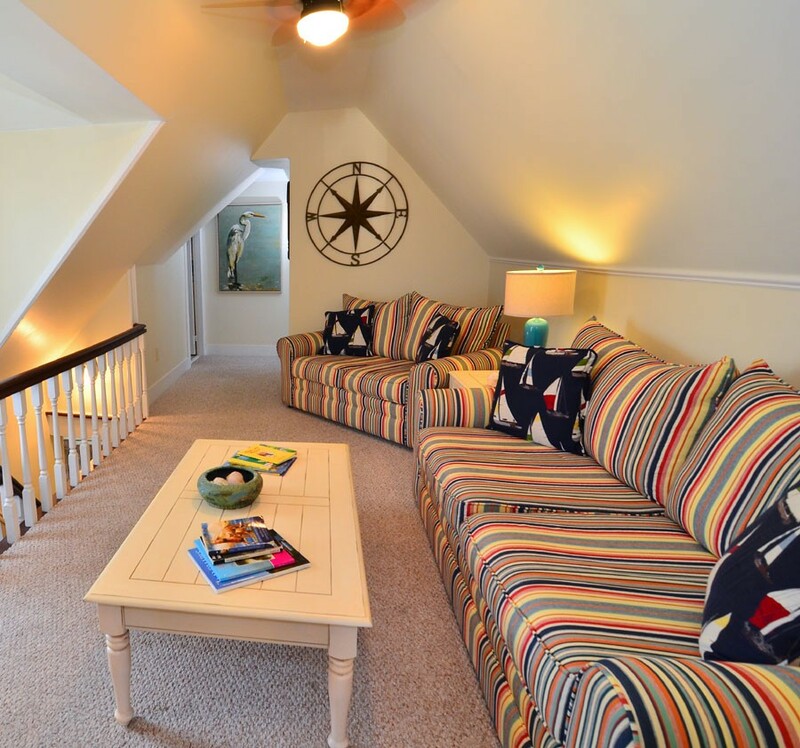 Here at Miss Molly’s Chincoteague Island bed and breakfast we strive to be your first choice for Virginia lodging. We aim to anticipate your every need. With that in mind, every guestroom of our bed and breakfast offers snugly new robes, an alarm clock radio, night lights in the bathroom, a hairdryer, tissues, face pads and cotton buds. Enjoy your stay at our Virginia Bed and Breakfast Inn. The light in Miss Molly’s room has a curious golden glow to it, and you can’t help but feel glad to have chosen this room. We offer a deluxe, new queen sized bed, an en suite bathroom and a private porch located just outside the door, that overlooks the side of the working Bay. It’s the perfect room for a romantic getaway! Queen size bed, private bath. Grand room where Marguerite Henry stayed, it has a luxurious King size bed, lace and flowing curtains, comfortable sitting area and full bath sets the stage for rest and romance. We also have a fireplace to heat your room in the chilly evenings. King size bed, private bath. The newly refurbished “Beachcomber” is Chincoteague’s only B and B room with two beds (a queen and a twin). Decorated with beach scenes and hand painted furniture, The Beachcomber will certainly inspire guests to hurry to the beach, relax and have fun! This is a perfect room to share with family or friends. The Beachcomber shares a huge bathroom and sitting room with the Yellow Room. These two bedrooms can be combined to make a lovely two bedroom suite occupying the whole top floor, perfect for larger families! At Miss Molly’s Chincoteague Bed and Breakfast we serve a gourmet breakfast. Freshly brewed coffee is available from 7:30 a.m. every morning to enjoy in the lovely screened in porch or to take to your room. 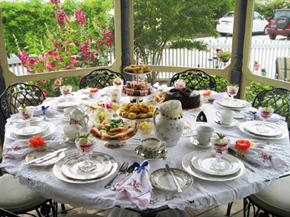 The breakfast is set with antique china and special cloth napkins, there is always freshly brewed coffee, English tea or warming Cocoa available, fresh orange juice and homemade breads, cakes and muffins with Lin’s famous homemade preserves. Welcome to breakfast at Miss Molly’s Inn. The first course here at our Chincoteague Island bed and breakfast will always be fruits, for example; blueberry compote with plain yogurt, honey and vanilla. Poached pears in a fresh raspberry coulee or fresh melon boats with prosciutto. The second course could be stuffed french toast with strawberries and cream with maple syrup and a special maple or hickory bacon, or smoked salmon and asparagus quiche with a puff pastry fruit basket or a full English breakfast with sausage and bacon tomato mushrooms and eggs, or homemade Belgian waffles with peaches and cream and a super European sausage; the list goes on and on at our Chincoteague bed and breakfast.